There are a lot of easy games kids can play with just a pencil and paper. Hangman and Tic-Tac-Toe are just a couple ideas. These easy and free games help keep the mind active and yes, they do actually learn. Strategy, new words, etc. It can also kick in that competitive drive to beat a brother or sister. Jenga is one of the best indoor building games that kids love to play. You can create a building game out of many household items. Kids find card tower building, Popsicle stick cities/houses or Lego building fun to play. More preferable you can make these games competitive like the one who builds tallest tower wins. Kids always love to be competitive. Puzzles are always good for kids as they exercise the cognitive and problem solving skills. There are many card game puzzles available in abundance. Kids can build their puzzle games using a cardboard and colors. Make them draw a picture on the cardboard and then cut it into pieces with scissor. Mix the pieces and you are ready with your puzzle. All you need is a masking tape to make your own balancing beam. Kids love to trace walk on straight lines. Make a game by turning on music and asking kids on walk in a one-foot-over-the-other fashion across the beam you drew with masking tape. Increase the challenge by asking kids to balance with one foot on the beam or walk backwards. Another interesting game to play is indoor basketball. Stuff needed to play this game is a rolled up sock and a bucket or even a close basket. Task is to throw the rolled socks into the bucket. While doing so, player takes a step backward with every bucket he/she scores. The player continues till he/she misses a shot. The player who scores a bucket from farthest wins the game. You can always play the classic basketball games like PIG as well. Always played in schoolyards, hopscotch can be a very interesting indoor game as well. All you have to do is to make 9 connected squares using a masking tape. Now boxes 1, 2 and 3 will be placed in a vertical column top of each other. Boxes 4 and 5 will be side by side followed by box 6, 7 and 8. The 9th box will be the “home” base. Next player will be given a marker like a stone and he/she will throw it in box one without missing it or touching the lines. If successful then he/she will hop on one foot in single squares and with both feet in side by side squares. He/she will pick the stone after returning from the same path cover the home base. 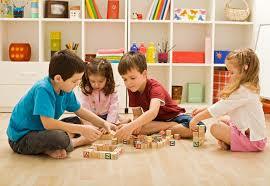 These are just some fun indoor games for kids can play of rainy days. The important part is to exercise the body and brain! Feel free to share some of your ideas for fun indoor games for kids below in the comments.